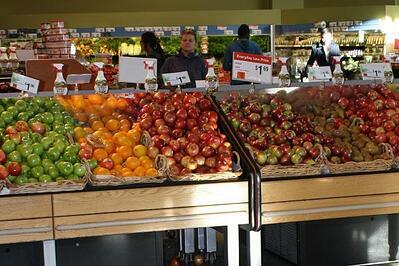 Grocery Stores: Making Your Shopping Trip Lean? You probably know that grocery stores have all sorts of tactics to keep you in the store longer—from making you walk all the way to the back of the store to grab a gallon of milk, to stimulating your senses by playing feel-good music and leading you through the bakery with the smell of fresh baked bread. The marketing gurus behind grocery stores theorize that the longer you’re in the store, the more items you’re likely to purchase. And at least from my personal experience, I think they’re right. However, consumers are multi-tasking more now than they ever have before. Grocery store trips, housework, and jobs all need to fit into one day. Now, marketers must balance their use of tactics designed to keep you in the store longer with the consumer need to get in-and-out as fast as possible. The Waste of Motion and Transportation is minimized by placing milk, eggs, and other staples in “quick grab” refrigerators in the front of the store. Most fruits and veggies are available cleaned and already cut-up in packages, ready for cooking with almost no preparation. This option is much quicker than purchasing just the raw food item, but it’s also more expensive. - Consumer transportation costs have also been minimized by “super” grocery stores that include just about everything—banks, post offices, video renting, and nail salons all located within the walls of the one store. While consumers look at this as a convenience, marketers look at “super” stores as a mechanism to keep you in the store longer. The Waste of Overproduction is minimized by reducing the price of baked goods and produce about to expire. Grocers win because their profit lost due to about-to-expire food not being bought is lessened. Consumers win too because they get a good bargain on a food item they were most likely thinking about using right away anyway. It’s all about balance, and grocers are doing a good job optimizing the shopper experience with Lean Six Sigma thinking—while still maintaining a healthy profit. Have you noticed Lean Six Sigma techniques at the grocery store?